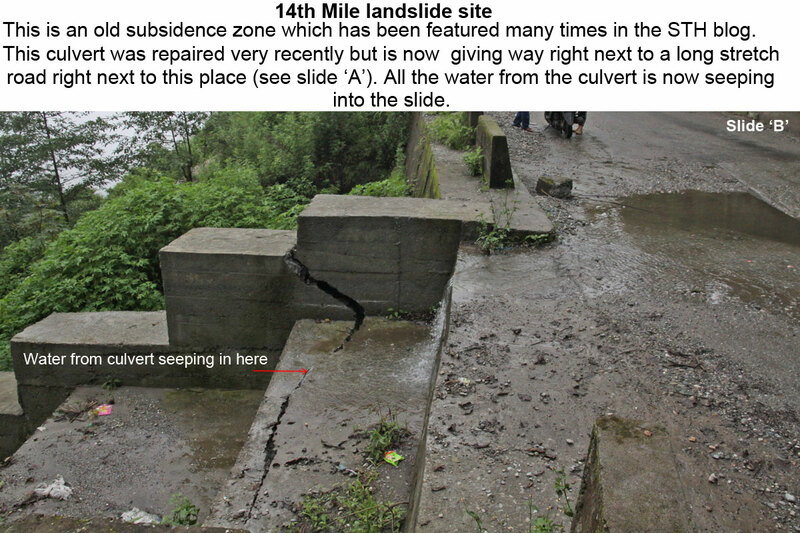 The 14th mile 'sinking zone' lying on the eastern face of the Kalimpong ridgeline is one of the old landslide areas of this town. 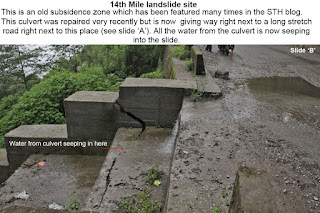 It is repaired on annual basis and is rumored to be a "blessing" to many a contractor - except that now with population growing and even a posh hotel coming up directly above this site, it will also be a curse to quite a few. 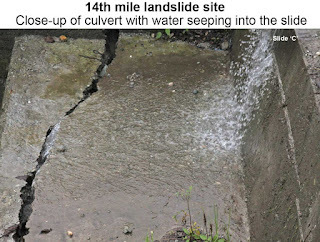 When I visited the site on 14Jul2016, I found that a portion of the road to Algarah had sunk considerably (slide 'A') and worse still the culvert next to it had also sunk (slide 'B') - and ALL the water from the culvert was percolating into the crack (slide 'C') acting as a lubricant to an unstable hillside ready to slide down. 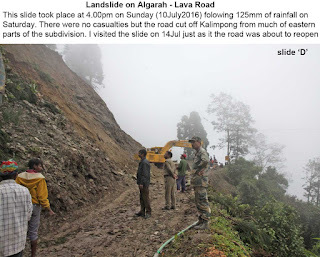 With our main road to the external world, NH10 always in a precarious state during the monsoons, we rely on the Kalimpong- Lava- Gorubathan road as our an alternate route to the plains. 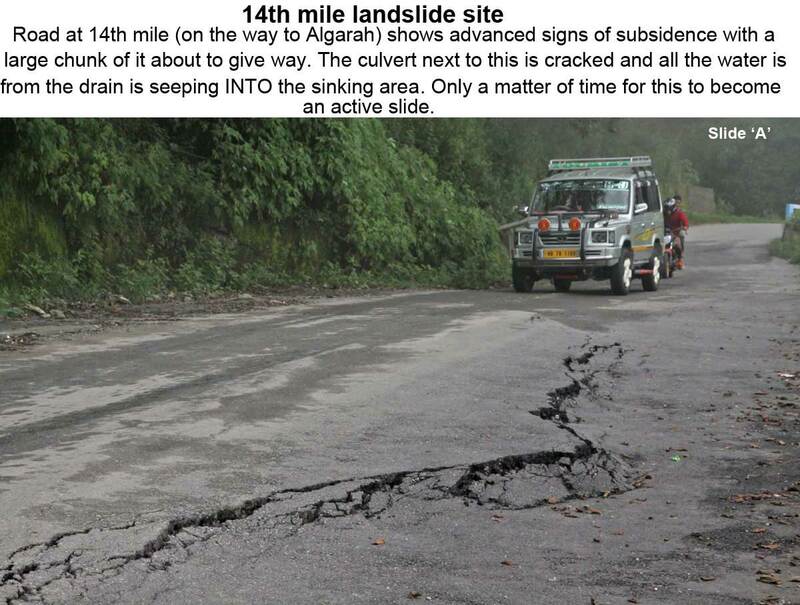 Unfortunately, this road also has quite a few 'hotspots' which keep the BRO busy during the monsoons. 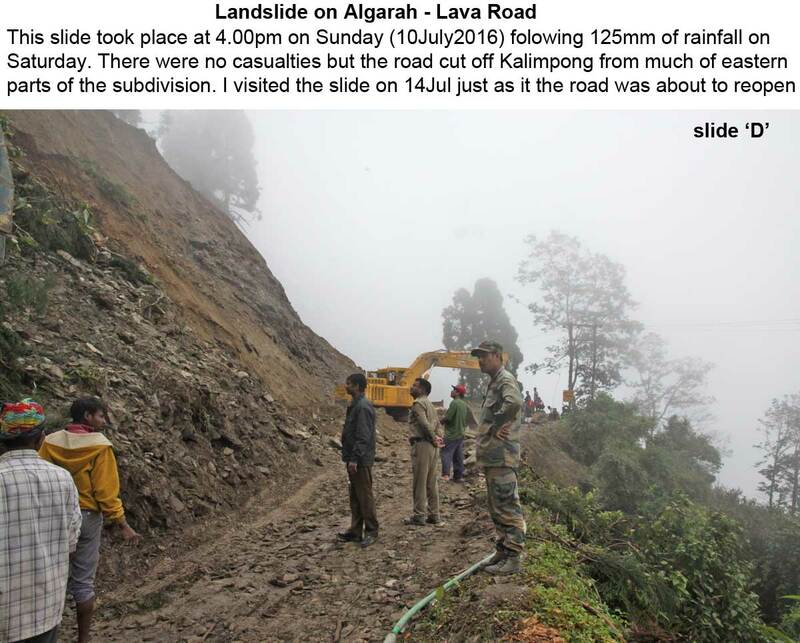 On Sunday, 10July2016 at around 1600h, following the 125mm rainfall of Saturday, a portion of this road near Rickisum gave way. 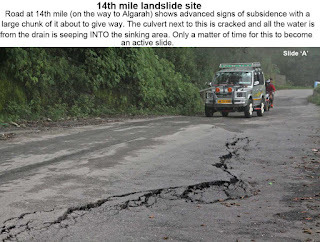 It remained blocked for 4 days and effectively cut off Lava and much of the eastern parts of sub-division from Kalimpong town.